Virtual reality has always felt like it’s on the cusp of becoming huge, but it has never quite managed to gain the momentum needed to put it in the hands of the mainstream. But with the original Wii showing the way, and both PlayStation Move and Xbox Kinect following in its footsteps, the signs are that we’re moving away from traditional gaming and towards a future dominated by alternative ways of interacting with virtual worlds. The final piece of the puzzle in bringing VR to the masses could be a simple and affordable method for allowing gamers to move around safely while they have headsets strapped to their faces. The WizDish aims to be just such a device. 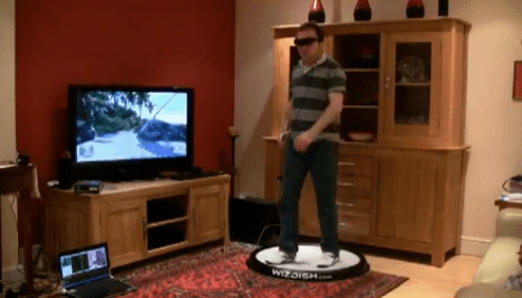 The WizDish is a small dish-shaped platform that allows gamers to walk around their virtual reality playgrounds. Perhaps “moonwalking” would be a more apt description, as the user slides on the slick concave surface of the dish to move their on-screen avatar around. It was created by Julian Williams before being fine-tuned by physicist Dr. Charles King. Williams owns the patent on the WizDish design. The theory behind WizDish is that removing the vertical movements we make when we walk doesn’t take anything away from the feeling of motion. So creating a platform that the gamer ensconced in a virtual reality environment can slide on means removing the need for them to actually walk anywhere. Williams states that WizDish makes it safe to walk, run, jump, and turn, as well as stop and start moving, as the game dictates. The methodology is demonstrated in the video after the jump. Read and see more . . .